my Salvation and eternall hapines. pose of it and apoynt it to be disposed of as followeth. fynding and allowing halfe the ear corn for all the ground. amonst them, and to be theirs wthin a month after my decease. hay Lotts without the Neck, wch I bought of goodman Potter. Lott bought of mr Lyn without the necke, alsoe one cows Comon. to be theirs after my wives decease. four children aforenamed to be theirs forever. witneses the marke of W William Dad__ Thomas Cartar. year of the time he is to serve. Thomas Cartar to be my executors of this my last will and Testament. a) "Middlesex County, MA: Probate Papers, 1648-1871," digital image, American Ancestors (http://www.AmericanAncestors.org : accessed 25 February 2018), Probate Packet #4,043, Thomas Carter of Charlestown, 1652 (original document). 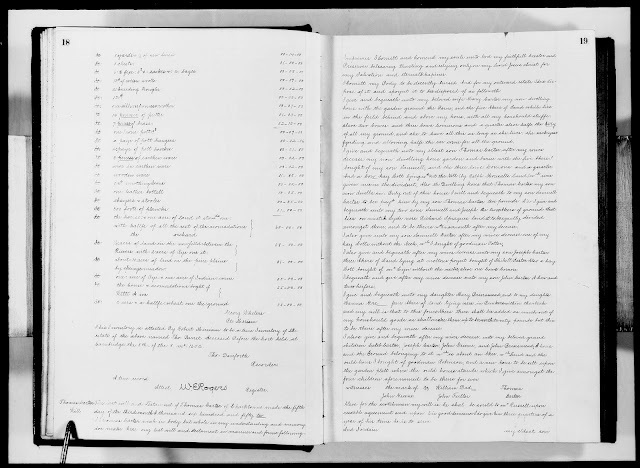 b) "Massachusetts, Wills and Probate Records, 1635-1991," indexed database with digital images, Ancestry.com (http://www.ancestry.com : accessed 25 February 2018), Middlesex County, Volume 28, page 18, Thomas Carter will (court clerk transcription of original). 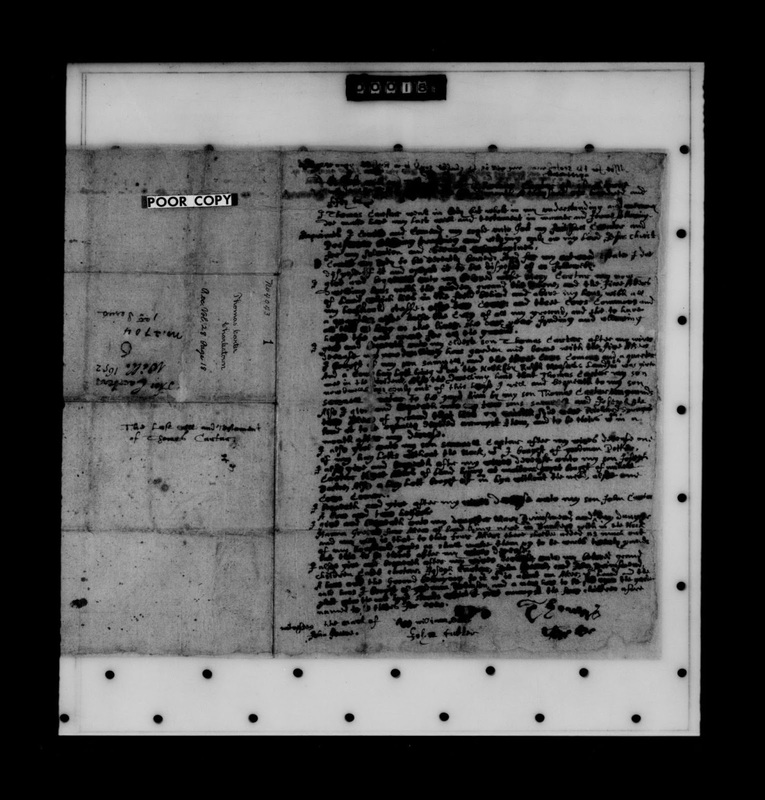 Thomas Carter's probate packet had a lengthy inventory attached which was much more readable (!). It was made 25 June 1652 by Thomas Lynde, John Hale and Ralph Mousell. The estate totaled £286 - 1 - 6. It included the dwelling house, shop, barn, out housing, orchard, yard, garden (£80), the dwlling house that son Thomas lives in (£30), "servant Mathew the Scotchman" (£14), four more plots of land (totaling £82-10), a sword, muskett, bandoliers, a green rug, etc.